This is the fourth in Stadium’s “Conference Chain of Command” series in which we polled a handful of veteran coaches in every league to determine the best JOBS in each league, all the way down to the ones that are the most difficult. This week’s Chain of Command is being published on Thursday instead of Friday due to Big Ten Media Days taking place on Thursday. Here are the eight categories that were utilized to determine the overall rankings. We did not utilize buy games as a category for the Big Ten because just about every program has the resources to buy a similar number of games. Facilities – Not just the arena, but also practice facilities, weight room, locker rooms, etc. Budget/Resources – Includes coaches’ salaries, recruiting budget, travel budget, private planes, cost of attendance, etc. 1. Indiana (98) – The Hoosiers are one of the more storied programs in college basketball history, but most of the success came decades ago. They have five national titles on their resume and eight Final Four appearances. Tom Crean took over a mess, but still underachieved, only going to four NCAA tourneys in nine years and failing to get past the Sweet 16. 2. Michigan State (97.5) – The Spartans have gone to nine Final Fours, including seven since Tom Izzo took over in 1995. 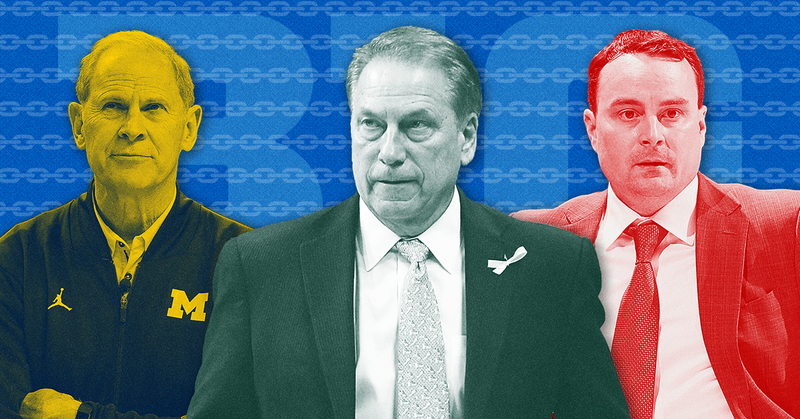 Michigan State isn’t on the top-tier among college hoops jobs, but Izzo has helped make it a clear top-10 gig. There’s plenty of support from administration to fans, and no shortage of resources. 3. Ohio State (82) – The Buckeyes have plenty of history, albeit significantly less in hoops than both Indiana and Michigan State. Ohio State remains a football school, but the Buckeyes won a national title in 1960 and have lost in the championship game in 1939, 1961, 1962 and 2007. Ohio State has had plenty of talent, from Jerry Lucas to Jim Jackson to Greg Oden and Mike Conley Jr. Chris Holtmann is in his second season after taking over for Thad Matta, who went to nine NCAA tourneys in 13 seasons (the Buckeyes were ineligible his first year in Columbus). 4. Michigan (75.5) – When you think of Michigan hoops, you think of the Fab Five – the group that lost in the national title game in 1992 and 1993. But it’s a program, while having some down years, that has churned out no shortage of pros, and also gone to eight Final Fours. Current coach John Beilein has taken the Wolverines to a pair of Final Four appearances. 5. Maryland (69) – The atmosphere and fan support is near the top of the league and there’s certainly a solid tradition (a national title in 2002 and 14 Sweet 16’s), but Maryland hasn’t quite lived up to the expectations of what some might consider a top-10 job nationally. 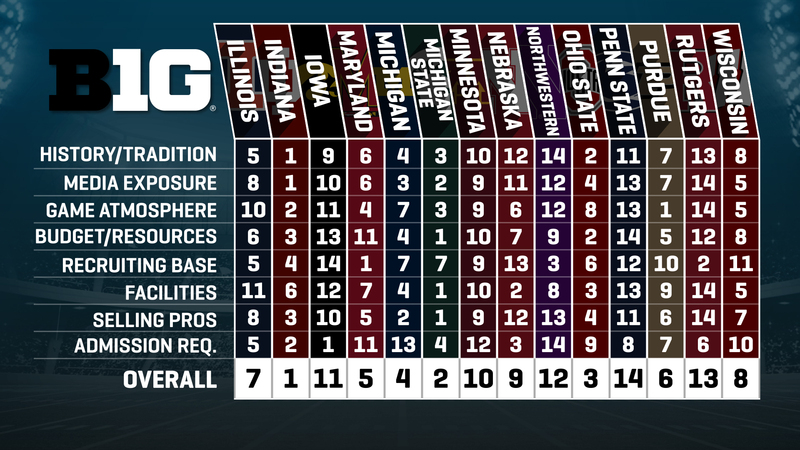 The recruiting base ranks first in the league, but the budget/resources are lacking compared to the top programs in the Big Ten. 6. Purdue (68) – The Boilermakers have gone to the Final Four twice – in 1969 and 1980. Matt Painter has taken them to the Sweet 16 four times in his tenure, and found a way to keep the program nationally relevant for the most part since taking over in 2005, but hasn’t been able to get them past the Sweet 16. 7. Illinois (62) – The Illini haven’t won a national title, but went to the championship game in 2005 and have been to four other Final Fours – in 1949, 1951, 1952 and 1989. There’s a decent tradition, but the fans are a little unrealistic with regards to expectations. Bill Self was successful in his brief stint, Bruce Weber went to six NCAA tournaments from 2003-12, but John Groce struggled in his time in Champaign. 8. Wisconsin (61) – The Badgers had a heck of a run a few years ago, going to the Final Four in 2014 and 2015 with a group that produced a pair of NBA players in Frank Kaminsky and Sam Dekker. Bo Ryan was a lock to take the Badgers to the NCAA tourney every year, but one thing that hurts the program is the lack of high-end talent consistently in the state. 9. Nebraska (54) – The good news? The Cornhuskers have big-time facilities. The bad? There’s virtually no players in the state. Nebraska has been to the NCAA tourney just seven times in all, and just once since 1998. It’s a football school for sure, and it’s a tough job to be the Nebraska men’s basketball coach. 10. Minnesota (42) – There’s actually a decent tradition with the program, going to the Final Four in 1997 and going to the NCAA tourney five times since 2005. In five seasons, Richard Pitino has gone to the NCAA tourney once. Minnesota ranks in the bottom half of every category. 11. Iowa (40) – Lute Olson took the Hawkeyes to five NCAA tournament appearances in his last five seasons, George Raveling went to a pair in three seasons and Tom Davis went nine times in his 13 years with the program. Steve Alford struggled in his eight years, going twice, Todd Lickliter went 0-for-3 and Fran McCaffery is 3-for-8 thus far. The lone category where Iowa ranks in the top half of the league is in being able to get kids into school. 12. Northwestern (35) – Chris Collins took the Wildcats to the NCAA Tournament for the first time in school history in 2017. There’s just not much tradition, but the major selling point is the academic component. There’s also no shortage of talent in the area, but the question is whether Northwestern can get the kids into school. 13. Rutgers (31) – Rutgers actually played in the Final Four back in 1976, but there hasn’t been much to brag about if you’re a Scarlet Knights fan recently. There hasn’t been an NCAA tourney appearance since 1991, when Bob Wenzel was running things. Kevin Bannon couldn’t do it, neither could Gary Waters, Fred Hill, Mike Rice or Eddie Jordan. 14. Penn State (25) – There have actually been nine NCAA Tournament appearances for the Nittany Lions, but just one since 2001. Pat Chambers has knocked on the door, but has come up empty thus far in seven seasons. Ed DeChellis was 1-for-8 before being let go. Penn State ranked in the bottom four of every category except for admission requirements.